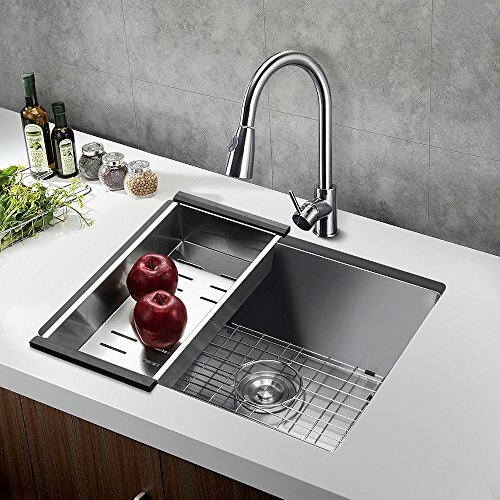 Modern Brushed Nickel Premium Grade T-304 Stainless Steel Single Bowl Kitchen Sink; 1 x Stainless Steel Single Bowl,1 x Stainless Steel Bottom Grid, 1x Vegetable Basket, 1x Soap Dispenser, 1x Sink Strainer; Dimensions for Kitchen Sink ?Outer Lip Thickness? : 11 Gauge; ?Basin Thickness? :18 Gauge; ?Rational Design:? : 4 diversion lines for easy drain; Fully Thickened Anti-Condensation Layer, Non-toxic, Non-odor Feature; EVA Material Reduce more More Than 78% Noise.